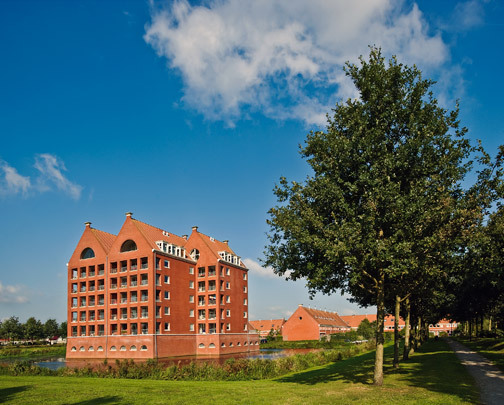 The village of Leek in Groningen province has been extended with an upmarket residential estate of 500 houses. The urban plan incorporates rural elements found in traditional country seats and courtyard farms, such as long avenues of trees, canals, pools and drives in a geometric composition. Central feature of the area is De Waterborg apartment complex. Designed by the Belgian architect Charles Vandenhove, its five portions sport tall gable roofs. Low-rise housing lines both sides of the drive leading to this 'moated castle'.